Prayer is one of the most powerful tools that we have in our life. It is an essential part of being a Christian and be ensured that our walk with Christ is in a progressive and correct path. The best thing we can do is to put prayer in our priority list and include it in our daily routine. We should spend some time alone with Him not just in times of need but also for comfort and guidance. I admit that for the past few weeks, I've been lazy about my daily morning devotions and my prayer time was slowly diminishing. Because of this, I snapped that resulted to discomfort and a tiring environment for me. My OCD things were becoming a hindrance in my "regular" routine. For no reason, I had to close and open the every door for five times. During my sleep, I woke up every two hours just to wash my hands and ensure that it is clean. I even cleaned my room at midnight and didn't care even if it takes me until early morning to finish. I also bought a handy vacuum cleaner just to be sure that every dust in my room will be cleaned instantly. It was so tiring but when I asked myself, "What is going on with me? Why is this happening again?" I assessed myself and found out that I haven't been talking to Him for quite some time because I became busy with work and other stuffs. 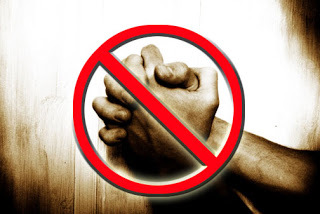 I started to pray hard again and my devotion is now on track and I have recovered from these nasty OCD things. I realized that prayers really help that it can lift your burden and reveal to you the wonderful things around you. It also helps us to make a wiser decision and have a clear mind in every step we take. In Matthew 11:28-30 (28 “Come to me, all you who are weary and burdened, and I will give you rest. 29 Take my yoke upon you and learn from me, for I am gentle and humble in heart, and you will find rest for your souls. 30 For my yoke is easy and my burden is light.”) states that He is just waiting and He is always ready to lift us up and find rest in His presence. Without prayers will make us very weak and can leave us confused about everything. Also, be reminded that if we are lacking of intimate communications with Him, we become a primary target of the enemy. They have several stages on how to feel us unworthy. First, they will discourage us that will lead to losing our hope that will result to doubt. Then if we are doubting, we can be in the state of disillusionment and they will whisper to us, "where is your God? ", "you are unworthy", "stop being a Christian" and if we listen to these lines, we have no other way but towards to great disaster. Let's keep into our mind, heart and soul that prayer isn't just about asking for something from Him but it also for our own comfort in times of needs, we find rest and most importantly, it is our surviving tool and this tool is our way for getting the correct assistance, guidance and protection. God is so generous that he always gives us a new beginning so why don't we start now to put back prayer in our priority list.